Access until you pass! 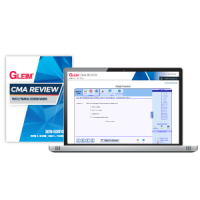 Gleim CMA Review System includes everything a CMA candidate needs to pass the CMA exam. 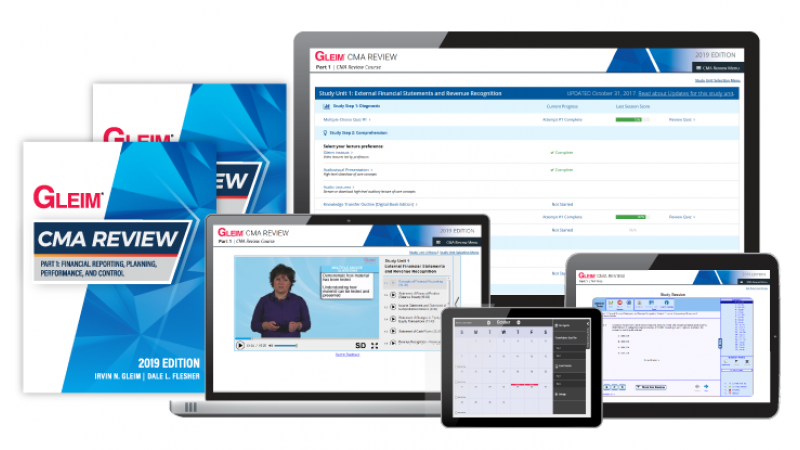 CMA Review System is available as a set and is also offered for each individual part. You will experience our flexible, easy to follow, three-step study approach, but with less guidance than our Premium CMA Review System. Gleim Online – The majority of your coursework will be completed in this guided, self-study review. Gleim Online includes your interactive study planner, exam-emulating quizzes, the Gleim digital book containing comprehensive outlines and examples, additional Essays, and Audio Lectures. You will also have access to your own mentor, a Personal Counselor;who will offer advice and assistance while you're studying for the exam. Gleim CMA Mega Test Bank, Gleim Audio Lectures, and Gleim Exam Rehearsal – Want even more practice and review? 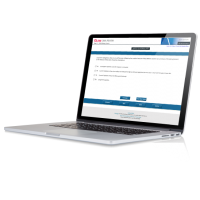 The Gleim CMA Mega Test Bank combines Gleim Test Prep and Essay Bank to form the largest bank of multiple-choice and essay questions on the market. Finally, during your comprehensive final review, take the full-length Gleim Exam Rehearsal to identify any remaining weak areas. Gleim Online, Mega Test Bank, and Exam Rehearsal emulate the Prometric testing environment and provide detailed answer explanations for both correct and incorrect answers. 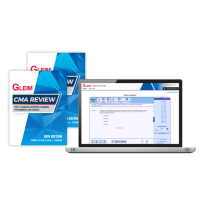 As long as you are preparing for and taking the CMA exam parts for which you purchased the Gleim Premium CMA Review System, we will ensure that you have current Access Until You Pass®. Your electronic material will update automatically in the event of content changes or a new edition, and we'll ship you the new edition book for only the cost of shipping. If you follow the Gleim "suggested steps" detailed in our Premium CMA Review System, are unsuccessful in passing the exam, and are not satisfied with the System, we will refund your purchase price paid for the applicable parts. You must request this refund within 18 months of your purchase. Take up to 30 days from the date of purchase to thoroughly review the entire first study unit of the System. If you are not satisfied for any reason, we will refund your purchase price for the System, or for the portions of the System that you return to us. This offer does not apply once you have gone beyond using the first study unit in the System, or if you did not purchase the System directly from Gleim. ​We GUARANTEE that you will PASS the CMA exam on your first sitting using Gleim CMA Review System. 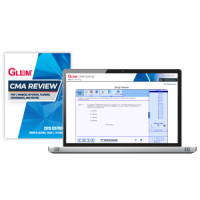 If you do not pass the CMA exam part(s) for which you have purchased the Gleim CMA Review System, you will receive unlimited Continued Access to all online components of the Gleim CMA Review System until you pass. Additionally, these online components will remain current for at least 18 months from your purchase date. See below for conditions and details. Conditions for "Access until you pass"
If you have to retake any part(s) and you choose the Gleim CMA Continued Access Guarantee, you must provide proof of current exam registration to qualify to have your course(s) extended past your original 18 months of access. Continued Access will be provided on a per-part basis. Contact your Personal Counselor by phone (International candidates are not required to contact their Personal Counselor by phone. They must contact their Personal Counselor by email.) before completing no more than two of the Gleim Online study units. Those using Gleim through a Professor-Led Review are not required to contact a Personal Counselor to qualify for this guarantee. Set up a study plan in the Gleim Study Planner in your Personal Classroom before completing no more than two of the Gleim Online study units. Complete 90% of the CMA Gleim Online study units in their entirety before sitting for the corresponding part(s) of the exam. This requirement can be satisfied by completing either 90% of each Gleim Online instructional element for all study units or by completing 90% of the Gleim Online study units in their entirety. Complete 90% of each question type in Gleim Online. This includes multiple-choice, true/false, and essay questions. Sit for but fail to pass the purchased part(s) within 18 months of your purchase date. Submit your Prometric results within 60 days of the close of the testing window in which you sat for the exam.